Wladimir Klitschko believes his former conqueror Tyson Fury (25-0, 18 KOs) would be no match for IBF/WBA/WBO heavyweight champion Anthony Joshua (21-0, 20 KOs) if the two of them were to square off today for a fight. Wladimir, 42, views Joshua as a better-rounded fighter than the 6’9” Fury, who recently weighed as much as 360 pounds. 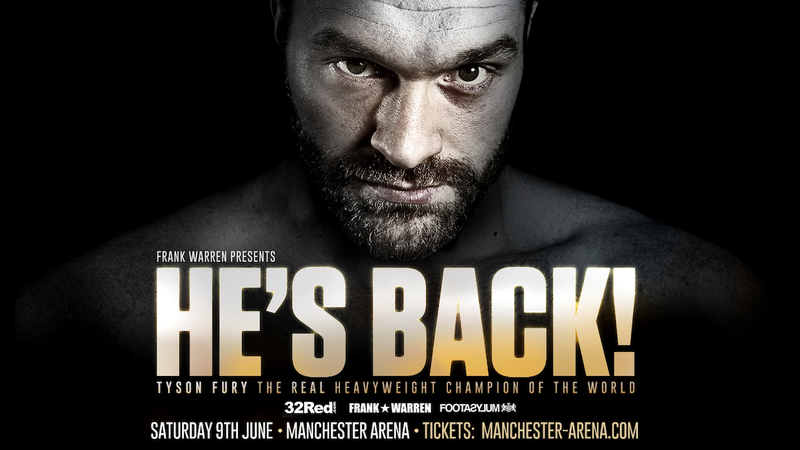 Fury is making a comeback after 2 ½ years out of the sport on June 9th against a yet to be determined opponent on June 9 in Manchester, England. There’s a lot of anticipation from the boxing public in Fury’s fight, as the fans want to see whether he’s still the same fighter that befuddled Klitschko for 12 rounds in beating him by a 2 round unanimous decision in November 2015 in Dusseldorf, Germany. “Hands down Joshua. He is getting to be the complete fighter. Technically, size-wise, weight-wise, power-wise. And he is a good learner,” Klitschko said to thetimes.co.uk. You have to take what Klitschko says about Fury with a grain of salt. He’s shared the ring with him and it didn’t go well for the Ukrainian fighter. Some boxing fans are already saying that Klitschko has a case of sour grapes due to his embarrassing loss to Fury in 2015. Klitschko was out-boxed by Fury the entire fight. It was such a one-sided fight that Fury showboated often in the second half of the contest, making Klitschko look like a novice. Fury probably wouldn’t do well against Joshua if he was to fight him in 2018, but that’s quite understandable. The 29-year-old Fury has been out of the ring for close to three years, and he’s lost a great deal of weight. But if Fury gets four or wins under his belt, he could give Joshua all he could handle. Former WBO heavyweight champion Joseph Parker and Carlos Takam both gave Joshua a lot of problems in his last two fights. We don’t know how well Parker could have done, because the referee that worked his fight with Joshua prevented him from working on the inside during their unification bout on March 31. If Fury can use his long reach to take away Joshua’s jab, which has now become one of his main weapons in his arsenal, then it’s quite possible he could beat him. Joshua couldn’t land his right hand against Parker. Without being able to land his shots, Joshua could struggle against Fury. READ The Heavyweight Division Continues To Fall Apart; Can It Be Put Back Together Again? Fury will be fighting for the first time since his victory over Klitschko when he enters the ring on June 9. Fury would like to put together 4 wins and then face Joshua. However, negotiating a fight with Joshua may prove to be an obstacle that prevents the fight from taking place. Fury wants a 50-50 split of the purse for a fight against AJ. Joshua’s promoter Eddie Hearn isn’t saying what he believes that Fury is worth, but it’s likely far below 50 percent of the pot. Fury will need to swallow his pride for him to have a chance at getting a fight against Joshua, because Hearn doesn’t seem to mind if the bigger fights are never made. Joshua can make good money fighting the contenders in the division. He doesn’t need to fight guys that are a threat to beating him like Fury and Deontay Wilder for him to bring in large purses.